Without bees, our entire food supply is in danger of collapsing, not just the bee colony. A phenomenon called colony collapse disorder (CCD) has been killing our bees since the early 2000s, but it looks like one of biotech’s favorite transgenic GMO crops could be the culprit – a pathogenic virus has jumped from the tobacco plant (tobacco is heavily GMO) to one of Mother Nature’s hardest workers – the honeybee. A new joint study from the USDA’s Agricultural Research Service in Beltsville, Maryland and the Chinese Academy of Agricultural Science in Beijing published in mBio, the American Society for Microbiology’s journal, suggests that aside from neonicotides, parasites, pesticides, and other bee killers, a tobacco virus is what is killing our bees. The study calls it the Tobacco Ring Virus (TRSV) and points to it as a probable cause of CCD. It seems strange that a virus could jump from plant to animal, but in the mad science world of biotech, it isn’t uncommon. The really scary part of the TRSV virus is that not only is it jumping from one species to another, but it is moving up 6 levels in biological hierarchy from the plant to animal kingdom. For those of you who have not studied biology, there are normally stop-gaps, or checks in balance in mother nature via 9 levels, namely: species, genus, family, order, class, phylum, kingdom, domain, and life. 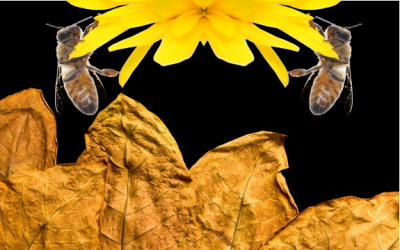 The plant virus spreads horizontally between bees and vertically from eggs to queen bees. While this might seem wonderful to those with a brown thumb, even more so to Tobacco companies of the Marlboro days, it also means that the GM tobacco plant is likely now going to keep spreading the TRSV with greater tenacity. Transgenic genetic engineering isn’t the be-all end-all that scientists thought it would be, and this is why it differs from cross-breeding or even hybridization carried out without genetic mutation. Transgenic engineering was supposedly successfully used to create a virus-resistant papaya in Hawaii, but GM papaya helped to create the very virus that is now jumping from tobacco to bee colonies – (PRSV). It’s your worst nightmare, folks, unless of course you look forward to bioluminescent people with an extra head and broccoli sprouts for fingers. This isn’t the real issue, the real issue is Neonicotinoids, the Tobacco based pesticide that is in heavy usage around the world. Neonics, as they are commonly referred to, are causing the collapse of the bee, and all pollinator populations. The GMO crops have a heavy roll in this because said GMO crops are engineered to be resistant to pesticides that kill Everything except the engineered crops; So all of the habitat for bee’s and other pollinators, like the Monarch butterfly, are being destroyed by GMO’s and the Pesticides that the companies distribute with them. go to beeactiondotorg to read more information about this and to contribute to the activism to save our pollinators from destruction by the hands of mindless corporate profit-driven drones who don’t have the comprehension to understand what their poisonous toxic products do to the environment around them. What’s even worse is they are currently in the process of trying to get, what we like to call, Agent orange Corn and Soy crops, passed by the USDA, which will increase the pesticide usage by an estimated 100 million pounds every year; which will leave nothing left but ravaged, nutrient deficient soil and no insects to pollinate the crops. GMO’s have already single-handedly DESTROYED the “United States” Agricultural Exports because other countries do not want the poisonous frakenfood that the “United States” is peddling. Don’t even get me started on the lies obama spewed in his campaign where he promised to wrangle in control of Big Agriculture, instead he promised Monsanto & Friends that they will have all the connections they need in his administration to do as they wish; just like the spineless joke of a fool that “Obama” Aka ‘Barry Soetero’, is ~ whatever he wants his fake name to be. This article is a little loaded. I do believe GMO’s are harmful, but the study this article is written about doesn’t mention GMO. I just mentions tobacco and tobacco ringspot virus (TRSV). Since tobacco is a heavily GMO crop it could be that the GMO version is the problem. But, the study is only about the virus and tobacco, and the article should only be also.